I nod. The man’s hair is gelled to a gleam and his black, ripped-at-the-collar t-shirt is simultaneously chic and casual. He’s got an acclaimed novel under his belt and is finishing up another. I have a secret crush on him, as do most of the women in the room, I later discover. His teeth are just so white. I mentally cross setting off my list. The word itself has an unimportant feel, reminding me of the long rolls of butcher block paper that we’d tempera-paint with branchy trees and turquoise skies that would crack when they served as a backdrop for the school play. The real action happens elsewhere. 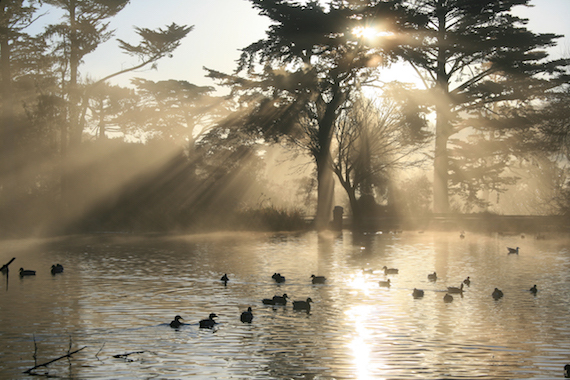 But when it comes to writing my next story, I can’t get Golden Gate Park out of my mind. I have no real clue who the characters are, whether we’re in first-person POV or third, or even if this is fiction or nonfiction, but boy, can I picture Golden Gate Park. And not just any old place in the park, but its historic merry-go-round. I’m hearing the music, the tinny notes that pull my child body across the long sweep of grass toward a spinning blur of color—promising not only lions and tigers and dragons, oh my!—but also the salty sweet pink popcorn that my grandmother always buys me after the ride. She had lived in San Francisco with my mother in the ‘30s before moving back to Sonoma County and reuniting with my grandfather. But she loved to take grandkids to the city. Writing, I’m transported to a place I haven’t been in decades. When I bring this story to the MFA workshop, a classmate comments, “I’m not sure what the piece is about, really. Whose story is it? Maybe that’s the problem.” Another adds, “I don’t get the main character. What’s motivating her? But the setting details are cool. I like that description of that carousel music. Haunting…in a good way.” He smiles at me, but it feels more like consolation than compliment. The prof agrees. “The setting details are great, though the plot’s got a few holes. But nothing you can’t fix,” he says, flashing me a toothy grin. The story morphs over the next several years. The plot—about a brother who seems to vanish into thin air and the newly married couple who can’t stop searching—expands and contracts, only to spill over again. I title the story “What You Do When You Don’t Know What To Do” (a good description of my writing process, too), then “Brother, Brother,” and finally “Bigger Than Life.” A first person narrator comes and goes, and the piece becomes solidly fictional, though its meaning remains elusive. But in each successive draft, the verdant places of Golden Gate Park keep calling me, reminding me of my childhood self who so badly wanted what I could only half-see. Other seemingly random setting details accumulate, the hollow look of fall sycamore leaves pressing against the window when the couple first learns the brother has gone missing, the diesely sound of the husband’s pickup gunning it up Broderick Street, the silver beams of the Bay Bridge floating overhead on their way home. Some details—the briny smell of Fisherman’s Wharf with a dollar crab cocktail in your hand, for instance—are memories of a San Francisco long gone. Many of these images never appear in the story itself, but all of them offer a way in. I do not abandon this piece, as I have done with so many before it, but keep working. As the environment fills in, the characters feel fleshier, as if at last they have a place to throw a backpack, or set down a coffee mug. By now I know setting reveals character, that’s Fiction 101. But strangely, setting details also suggest some sort of narrative arc: the brown-edged sycamore leaves show up as thick-veined and green at the story’s end. Not that the piece has a happy ending. Far from it. But whatever shape I can find I relish, because this story does not fall within the conventional conflict-crisis-resolution pattern. In fact, it seems the dénouement could just last forever. An underlying meaning surfaces, too—as slowly as a Polaroid developing –when a person goes missing, nothing can be neatly contained or expected. The prof goes on to teach at other universities and publishes a second novel, widely praised as gritty and redemptive. The characters are indeed powerful and act out their struggles inside cars and bars and bathrooms, walls that trap not expand them. I take other workshops, always heavy on the craft elements, because how else can you get your hands solidly around something as elusive as creativity? I notice that “setting” is always stuck somewhere in the middle or end of the course, as if to say, now we’ve got the meaty subjects out of the way, let’s turn to others. Some courses don’t touch on setting at all. The books on writing I read reflect this lack of emphasis. Stephen Koch in The Modern Library Writer’s Workshop warns, “…unless you’re writing a travel book, it [setting] will never get you where you want to go.” John Gardner’s The Art Fiction asserts, “plotting…must be the first and foremost concern of the writer.” In the Table of Contents of other books—Julie Checkoway’s Creating Fiction and Sarah Stone and Ron Nyren’s Deepening Fiction—setting falls in the long shadow of characterization and sensory detail. Jerome Stern’s Making Shapely Fiction does not mention setting in his “Alphabet for Writers of Fiction,” though character, dialogue, plot, point of view, and narrative appear. So is my experience with “Bigger Than Life” a one-off? I wonder. It’s not that I find character and plot and structure unimportant. It’s that, for me, they’re deeply intertwined with place. The smell of pine needles crackling in a living room fireplace, a blue-brown mountain appearing around the curve of a narrow highway, a parking lot full of battered and broken San Francisco Muni buses, these images open doors to worlds of other stories that come. These details are not simply “germs,” as Gardner would put it, but at the heart of the story itself. And none of them belong to places I now inhabit. It seems I can bring these images forth only long after I’ve gone. After several years, I’ve completed seven stories based in and around San Francisco. A good chunk, but hardly enough for a collection. If the books on writing I come across don’t reflect the importance of place, many of the stories I read do. James Baldwin’s “Sonny’s Blues” could not exist outside 1950s Harlem; its shadowy light and dark are keys to meaning. In Charles Baxter’s “Snow,” we focus on the ice of Five Oaks Lakes threatening to crack under the weight of a teenager’s Chevrolet. John Cheever’s narrator, Ned, in “The Swimmer” makes his way through the pale green and gold waters of a series of swimming pools, his life falling apart over what he perceives as a single afternoon. When I finally receive my MFA—a year later than everyone else in my class because I’m such a slow writer—I’m lucky to land a job teaching writing in Berkeley. Instead of paying attention to my own experience, I dutifully take my place in a long line of creative writing instructors and cover “setting” somewhere in the middle of an introductory creative writing course. At last, I feel the flicker of recognition. Truby’s right, there’s no hierarchy, just an intimate connection between people and place. I feel a new license with the details that keep rising in my mind, a freedom to let them take me where they want to go. Many of the places I visualize no longer exist, destroyed by the wrecking ball to make way for high-rise apartment buildings and supermarkets. But many—Benjamin Franklin’s statue in North Beach’s Washington Square Park, the rose garden in Golden Gate Park, Dewy Monument in Union Square—remain. The pace of my writing picks up, but not all that much. Writing, no matter how you cut it, is hard. What changes most are the words I use. No, not setting, not backdrop, I tell students and myself, but world. A word with seemingly endless possibilities, a word you could walk around in, climb a tree, or float from a cloud, then maybe settle down and finish a book. Amazingly, two years later, I do. Laurie Ann Doyle s new book of stories, World Gone Missing (Regal House Publishing), has been praised by The New York Times bestselling author Edan Lepucki, for delivering “astute portrayals of people who desire connection, hope, and renewal." Winner of the Alligator Juniper National Fiction Award and a Pushcart Prize nominee, her stories and essays have appeared in the Los Angeles Review, Jabberwock Review, and Under the Sun, among many other journals, and anthologized in Speak and Speak Again (Pact Press). She teaches creative writing at the San Francisco Writers Grotto and UC Berkeley. More at laurieanndoyle.com. It's miraculous that these little darlings didn't get killed in the rewriting process. The favorite book I wrote starts with people sitting around a campfire in the woods. Besides that, all I know is they’re 20-somethings. I don’t even know how many. The book told me everything from there.